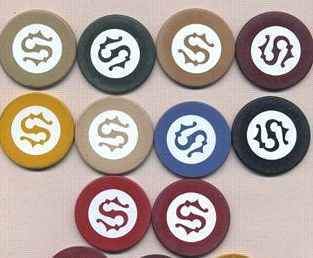 Other die-cut monograms -- not-USPC -- Antique Gambling Chips Co.
¶ orange, lavender, brown, green. ¶ I found this chip at Bazaar Supply and Equipment Co., Yonkers NY (also carrying on business as Berk Trading Corp., Inc.). The old-time owner told me that they were ordered for the biggest crap game in Manhattan at that time (about 1975). Whatever the provenance, they are certainly very collectible as unusual monogram chips. After many years in business, he closed shop about 2003. ¶ used, worn. I have one chip: one side is fine; the other side has some "damage" to the inlay. ¶ new discovery of a new die-cut inlaid "Y." ¶ chips are faded, might have burn on one side. ¶ the red "Y" is pictured to show you the old common POA series inlaid Y. ¶ used, ok, but the blues will most likely have a burn on one side. I have about only 8 blues. ¶ GREAT CHIP. Click here to see all three colors and the white chip scored to highlight the C-mold. Many unusual things about this chip: "B' on one side and "D" on the reverse; C-mold; inlay is small (about 3/4", not the usual one inch; unusual design of the monograms. ¶ C-mold chips were made in very early 20th century -- made by the Harris Company, Brooklyn NY, and early H. C. Evans, Chicago. ¶ white, blue -- I have only one chip of each color. ¶ very unusual inlaid "L." Not part of any known monogram series. ¶ white (have only 2 chips altogether). ¶ the "D" design is the same as the "D" in chip ODC-5, above -- click the link there to see the "D." However, this chip is different in many ways: the inlay is a full 1 inch; the "D" is on both sides of the chip; and it has a flat/plain mold. 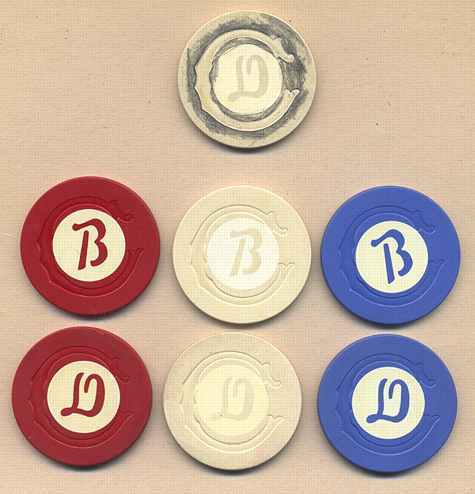 ¶ red, white (have 2 chips of each color). ¶ white -- have just this one chip. ¶ unusual design of the "E" -- not in any of the monogram series. ¶ here is a picture of all the chips/colors.